Tickets are a great tool that can extend your ability to keep in touch with your customers. When used correctly, they offer a way to reach you, even after working hours. There are quite a few ways to create tickets. 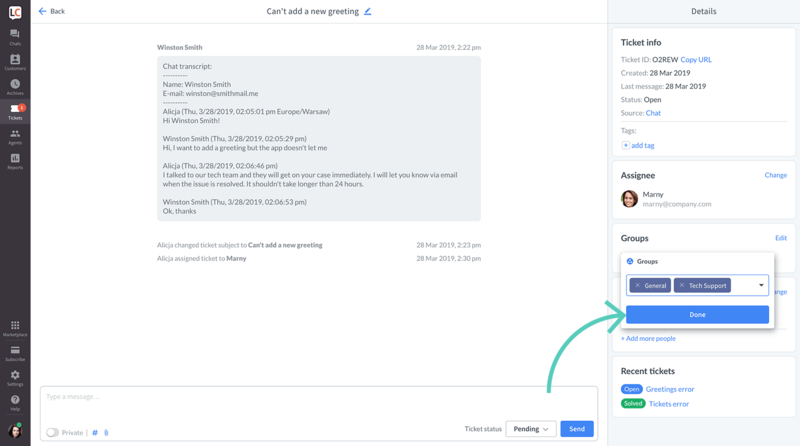 For example, your customers can leave messages, via the ticket form, that appear as tickets in the LiveChat app. You can also create tickets inside the app. But at the end of the day, they are all stored in the Tickets section. Below you can see a short overview of what’s inside the Tickets section. 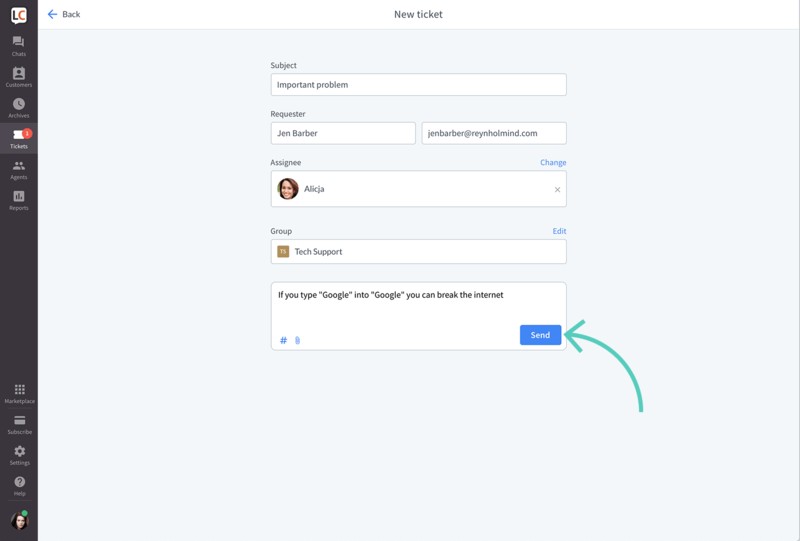 New ticket—click on the button to create a new ticket. Search bar—type in details to find a specific ticket. 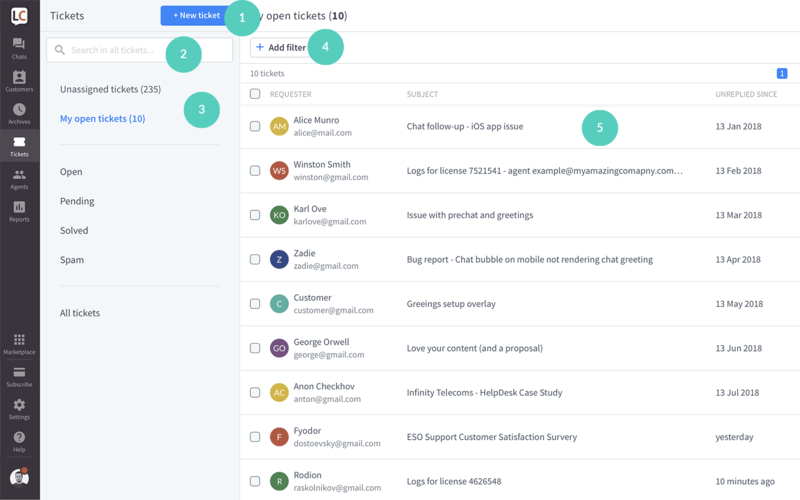 Tabs—you can quickly access tickets that belong to different categories: unassigned tickets, my open tickets, open, pending, solved, spam. There is also a separate tab for all tickets on the license that you have access to. Add filter—use filters to narrow down the tickets list. Ticket list—hover over a ticket to see a preview. Click on one to open it. Once a ticket has been created, you can edit it, reply to the customer, add tags and many more. Below you can see what you can find in the single ticket view. Ticket subject—edit it by clicking on the pencil icon. Ticket feed—the entire ticket history. Text area—here you can reply to the ticket, create a private message, add files and change ticket status. Ticket info—basic information about the ticket; you can find and copy the ticket URL here. 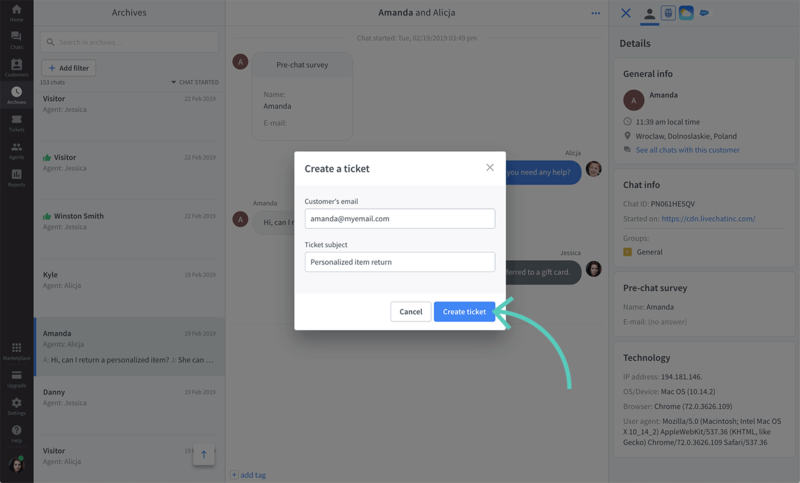 Assignee—see, add and change the agent assigned to a ticket. 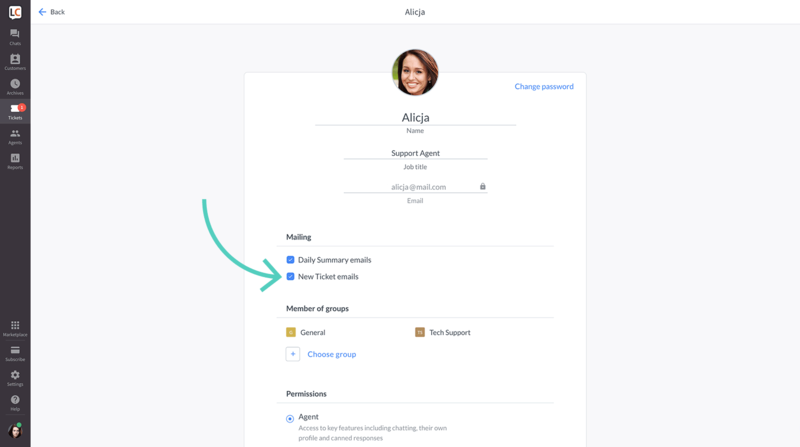 Groups—check, add and remove groups. Requester—see and change the customer’s name and email; you can also add additional people to keep them in the loop. Recent tickets—all tickets that are assigned to the same email. When all you agents are away, a ticket form appears in the chat widget. 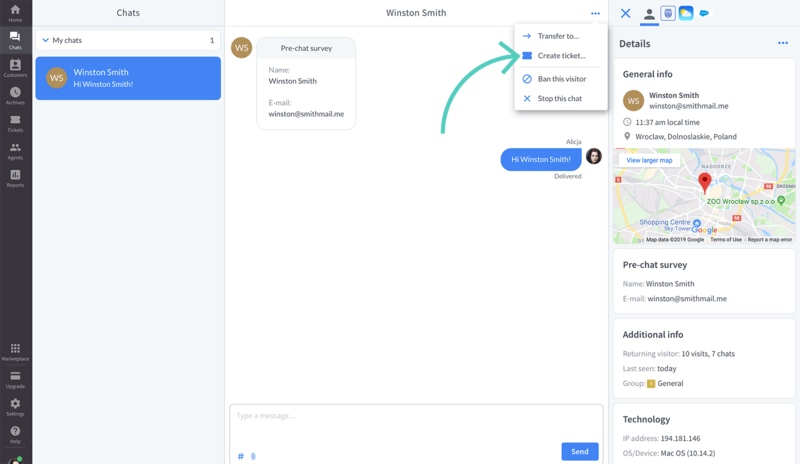 This is where customers can leave messages for the agents to answer when they are back at work. These messages appear as tickets in the LiveChat app. You can change the displayed message in Settings → Chat surveys & forms → Ticket form. Configure the form by adding and editing various fields. Remember to click on the Save changes button when you’re done. 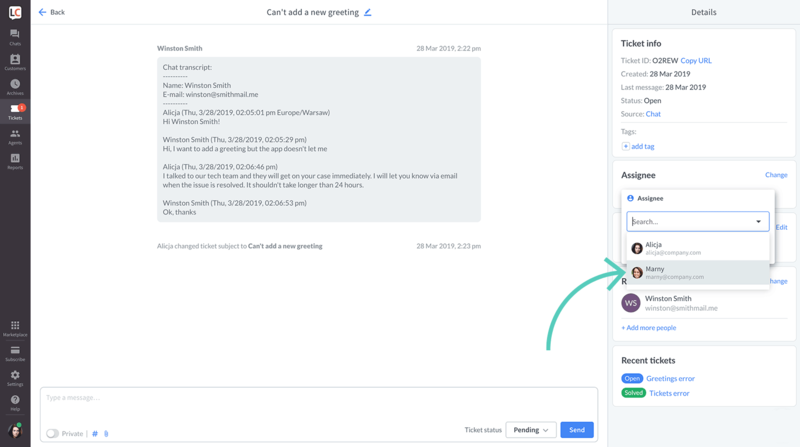 If you forward your support emails to LiveChat’s ticketing system, you can reply to your support communication via tickets in LiveChat. Read more about forwarding emails to tickets. 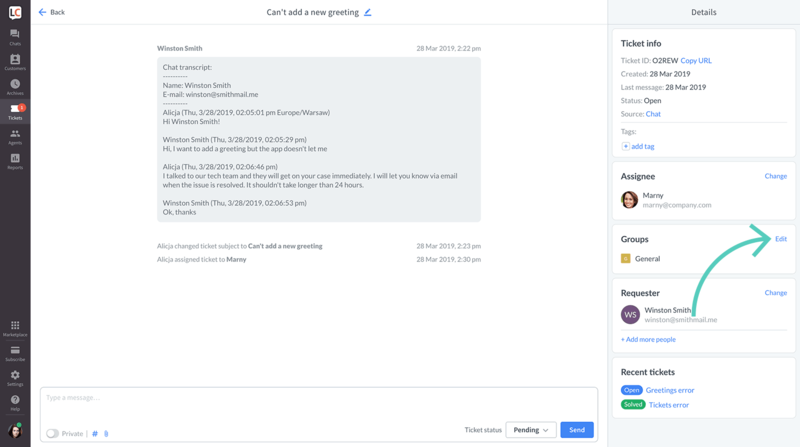 You can add tickets manually during a chat. 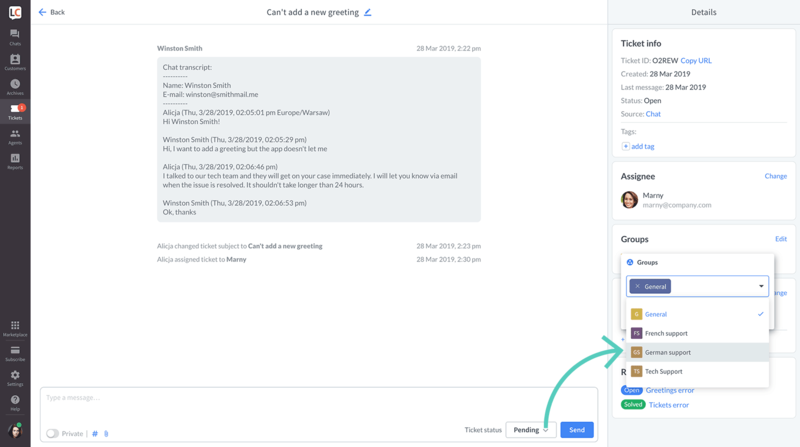 When chatting with a customer, click on the More button and choose Create ticket from the menu. Type in the customer’s email and the ticket’s subject. After you do that, click on the Create ticket button to finalize. After the chat ends, you can still create a ticket from this chat in the Archives section. Simply find the particular chat, open the More menu in the top right corner and click on the Create ticket. 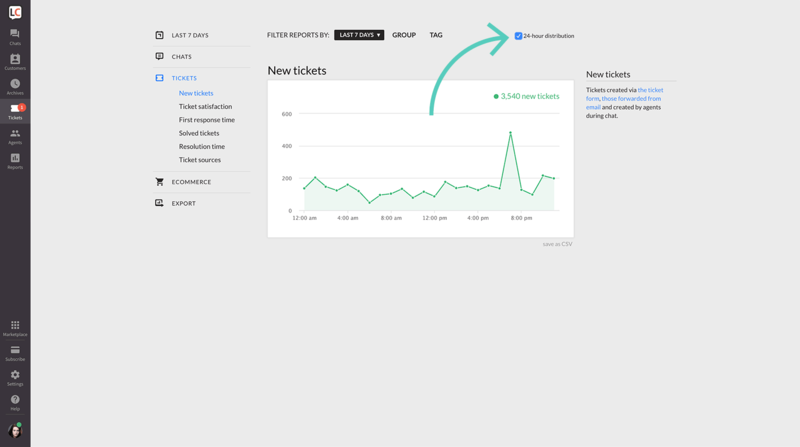 Finally, the Tickets section offers an additional way to create tickets manually. First, click on +New ticket. Then, fill in the details, and describe the case. Click on the Send button to finalize. Once you have created a ticket, you can either handle it all by yourself or, if this is a case that requires the assistance of another agent, you can change the person or group assigned to the ticket. Click on Change assignee in the details bar. Choose an agent from the list. Click on Edit groups in the details bar. Make sure that, when changing the assignee of your ticket, the status of it is set to Open – otherwise the agent will not see the ticket and the case might stay unresolved for a longer period of time. You can assign four different statuses to your ticket. Open tickets are cases that await action from the agent. All new tickets get the Open status. If the customer responds to a Pending or Solved ticket, its status will be changed to Open automatically. Pending tickets are cases that await a response from the customer. When you reply to an Open ticket, its status will automatically switch to Pending. After the customer responds, the ticket will switch back to Open. Solved tickets are cases that are completed. Mark tickets as Solved only if you are sure that your customer received all the answers. Spam is a category reserved for malicious or otherwise unnecessary tickets. 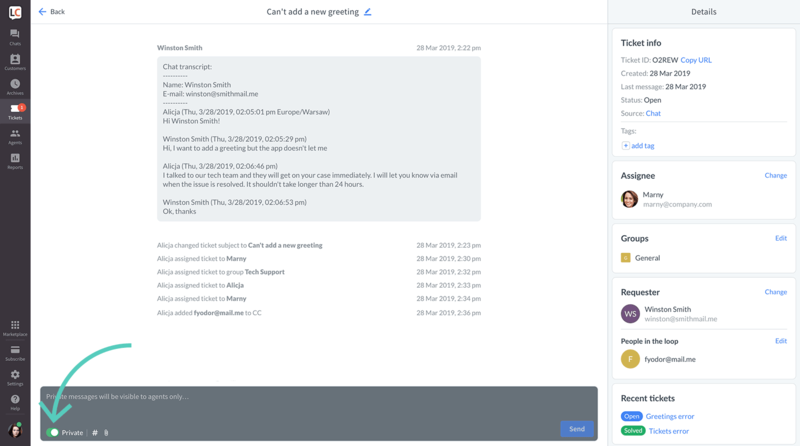 Once you place a ticket in your Spam folder, sender’s email address gets blacklisted, and all their future messages send from the same email address will land in the Spam folder. To change the status of a ticket, open it and select its new status from the drop-down menu in the bottom right corner. Confirm the change by clicking on the Send button. When managing your tickets at LiveChat, you can use the private message feature to make some notes about the case or describe the ticket before passing it to a different agent. Which makes it easier to understand the case better and take care of it instantly, instead of reaching out to you again. To use the private messages option, open a ticket and enable the Private switch. Now, enter your message and click on Send. 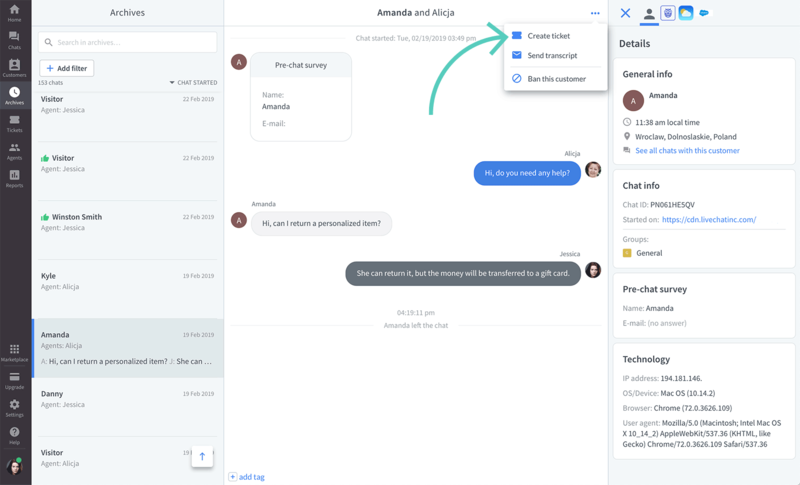 Private messages are visible only to other agents, not to your customers. Select an agent on the list and click on the Edit button (you will find it in the top right corner). Check the New Ticket emails option. By replying to the email, you or your agents can directly respond to the tickets from their inbox. The ticket will be automatically assigned to the agent that replied to the ticket. If you are using an autoresponder, consider disabling this option. 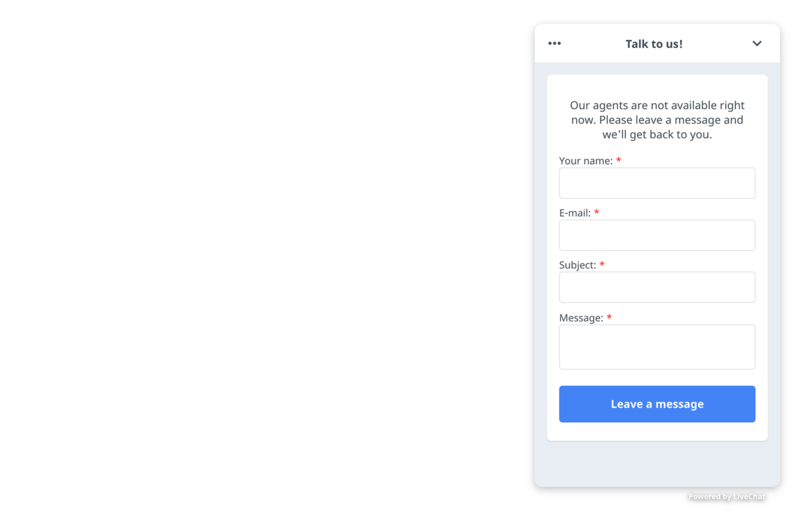 The automatic response will be sent from your inbox automatically and assign the ticket to you, other agents won’t be aware of it. This is especially important if you are going for a vacation as you probably won’t be checking your inbox. 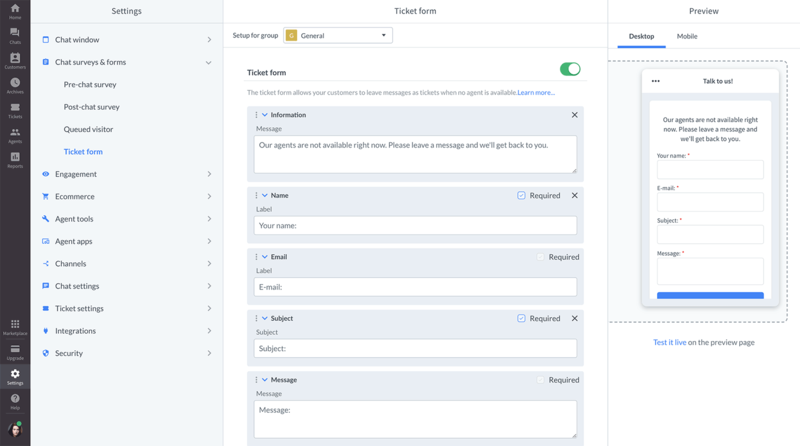 New ticket notification—a customer gets an email notifying that a ticket has been created for them; the customer can respond by replying to the email. Ticket rating request—sent 24h after a ticket was solved; prompts the customer to rate the quality of customer service they received. 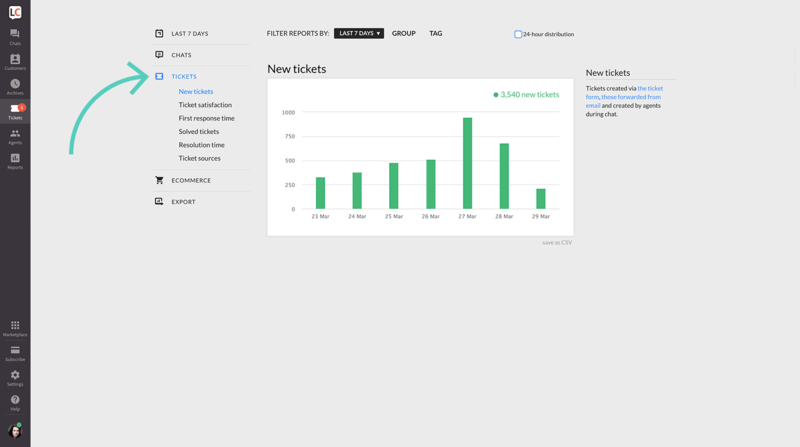 Stats can be later viewed in the Ticket satisfaction report in the Reports section. Read more about ticket ratings. 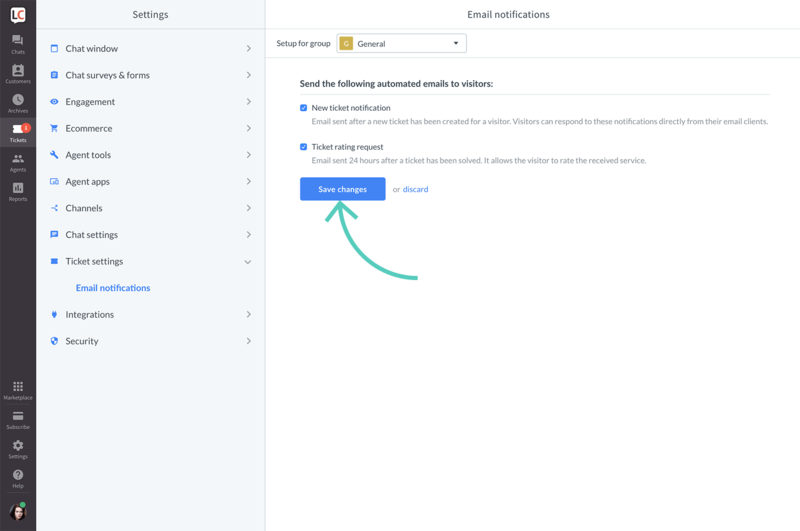 Go to Settings → Ticket settings → Email notifications. Check emails that you want to send and uncheck ones that you don’t want to send. Once you are done, click on the Save changes button to finalize. New tickets—check when you received the highest number of tickets. Assign additional agents to ticket resolution during the busiest part of the week. Ticket satisfaction—your customers can rate the service they’ve received after each resolved ticket. First response time—how long it takes for your agents to respond to new tickets. Try keeping this metric below one hour; however, you can always try going lower for the best customer experience. Resolution time—average time it takes to resolve a ticket. It gives you an idea of how fast support cases are handled by your team. Ticket sources—see how many of your tickets were generated by chat, email or the ticket form. All statistics can be viewed in a 24-hour distribution mode. You should reply to all tickets as soon as possible. This will reassure your customer that you are aware of the problem and you are looking into it. Try keeping your first reply time under 30 minutes. When it comes to ticket resolution, you should aim to get a ticket resolved within 8 hours after its creation. Keep in mind that most tickets can be resolved within an hour and only the most complicated cases will require more time. Additionally, try increasing your online time. This way, you won’t get as many offline messages and have the most opportunities to chat with clients and solve their problems immediately.